The literal asterisks had to be matched with *. ( ) creates a matching group, which can be used later in the replacement string with \1 or \2 etc. The \1 matches the first matching group in the search string That is, \1 will match everything on the line after the 3 literal asterisks. Your matches will be highlighted. Click ‘n’ to jump to the next match. Vim has a cool, intuitive way to explore your command history. In command mode, type “:” as for typing an ex command, and then press the up arrow to scroll up to through your command history. 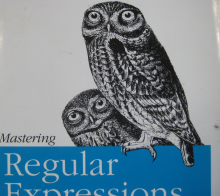 This is really handy for using previous, complex regular expressions.